From the first grade I was known as the “fat girl”—the only fat girl. Yeah, there were a few other chubby kids around, but none as big as I was. I guess you could say I “overshadowed” everyone else. Being the biggest meant I got the most teasing and name calling from the other kids. You know how every classroom has their favorite victim to pick on? I was that favorite from first grade all the way up until eighth. Lucky me. And it didn’t help that I could rarely find clothes that fit me so I had to wear black tights and oversized guys’ T-shirts pretty much every day throughout elementary school. I wasn’t exactly making a fashion statement, even by ’90s standards. By the time I hit fourth grade I was well over 100 pounds and had pretty much heard it all. I had been called everything from the “Pillsbury Doughboy” (a mean boy in my class used to poke me in the stomach and tell me to say “Woo Hoo!”) to a “pink cupcake” (I was wearing a pink shirt, and I guess a fat girl in pink looked like a cupcake?) to the all too classic “fatty” (one time a boy ran up to me during PE class just to tell me I was fat—seriously, how rude is that?). I learned early on that people can be cruel, really cruel. I also learned that if you’re fat, or different in any way, you’re not cool, pretty, or even likeable. Nobody in my class wanted to be caught socializing with the “fat girl.” So I kept to myself and kept quiet. By this time my confidence was so low I was more than willing to accept the fact that no one liked me because of how I looked. I mean, I hated how I looked too! Who was I to be worthy of their attention? I hadn’t always been so self-conscious. Before I even started kindergarten I had a passion for fashion. I would page through my mom’s magazines and clothing catalogs from cover to cover, envisioning myself in all the pretty clothes. Dress-up was one of my favorite games to play, and let me tell you, I had an awesome sense of style! My parents have a picture of me wearing a sparkly dress that I had smartly accessorized with a baseball cap and a diaper. I knew all about modeling and looking cute for the camera. I even practiced my “cat walk” in my living room! Being a bit bigger than my sisters and cousins never stopped me from rocking my imaginary runway. Boys have such a way with words, don’t they? I remember my face flushing. How embarrassing! That was the first time I had been called out for being the chubby girl. In my first grade mind this was a terribly humiliating experience. And it wasn’t long before more followed. Matt turned out to be pretty mean (he was the boy who called me the “Pillsbury Doughboy!”) and continued to taunt me over the years. I’m not saying I wasn’t excited about losing so much weight. Of course I was! For the first time in my life, I was able to fit into clothing not labeled plus-sized. I could walk into any store and find something I wasn’t too big for! Unless you have been shopping at Lane Bryant since the fourth grade, you cannot even imagine how great that felt. Finally, I was done with being the “fat girl.” Now I could really start over and live the life I’d always wanted. Why bring up the fact that I used to be a 230-pound middle school loner? That wasn’t me anymore, so why did everyone have to know about it? My fear was that people, especially my peers, would immediately think of me differently once they heard about my past as an obese outcast. For once in my life, I was treated like a normal person. People were not afraid to approach me in fear of “catching my fatness.” And I was not afraid of approaching other people in fear of them judging me because of my size. My fear of rejection held me back from building true friendships with the few friends I had made in middle school. But as the weight vanished, so did my fears. Those few friends quickly became my best friends (still are today! ), opening me up to a social life like I’d always wanted. Maybe it was because I wasn’t so caught up in the whole “instant weight-loss diet pills” and “magically slimming” infomercial products that I was able to stick to the math. I mean, I was definitely no expert in health and fitness. I didn’t know how long it was going to take to lose 100 pounds. I didn’t know how long it would take to lose even one pound! I was clueless about calories and how many I should or shouldn’t be eating. The “fat burning” zone on the treadmill meant nothing to me. And what was the deal with healthy carbs versus bad carbs? There was a lot I didn’t understand about weight loss. What I did know was that I was done with being fat. I also knew that just thinking about changing wasn’t going to change anything. I began to love seeing the looks on girls’ faces when I told them I had done it all on my own. Their eyes would shine bright with surprise and, more importantly, with hope. I knew where they were coming from because I had been where they were—overweight and unhappy. But I hadn’t remained that way; I had changed. Now they knew they could too, and without any special surgery or complicated diet program. It made me feel so good when they told me that my story had motivated them to immediately start eating right and exercising. I became aware that my lonely childhood was not so unique. I had not been the only “fat girl” in the world. I’d only felt that way. There are many girls who experienced what I experienced. And there are many more who are even now struggling with their weight issue. For these girls my story really is amazing. Hey, if I can do it, so can they, right? They dream of a better life as a new person but they don’t know how to make it happen. Fortunately, I do know how to make it happen, and it is for them (and you, of course)—everyone who shares that same dream—that I decided to write this book. If you are reading this with the hope I’m going to reveal some secret fat loss trick or gimmicky diet plan, you’re going to be disappointed. Like I said, $60 billion is spent on unnecessary diet books and “fat burning pills.” Obviously, what I’ve done did work, and I never spent a dime. In this book I want to show you how it is possible to change your body on your own no matter what your current condition and circumstances are. At the end of the day, all the latest exercise equipment, great-looking fitness trainers, and doctor certified prepackaged meals don’t matter much. You don’t need any of that! I didn’t have any of that stuff. What I did have was an intense desire to transform my body and the determination to make it happen. In my opinion, that’s all you need to do most anything. I hope reading my book will inspire and motivate you to begin changing your life. Why not have the body you want? Why not have the life you want? If it’s your dream to be beautiful and fabulous, then don’t just sit there thinking about it—do something! If you want to become a marathon runner, start running! Stop holding yourself back and stop hesitating. You’ve got nothing to lose (except some unwanted fatty tissue). Stop making excuses and make it happen. I know you can. Deep inside, you know it too, don’t you? Now, quit wasting time. Change your body and you will change your life! 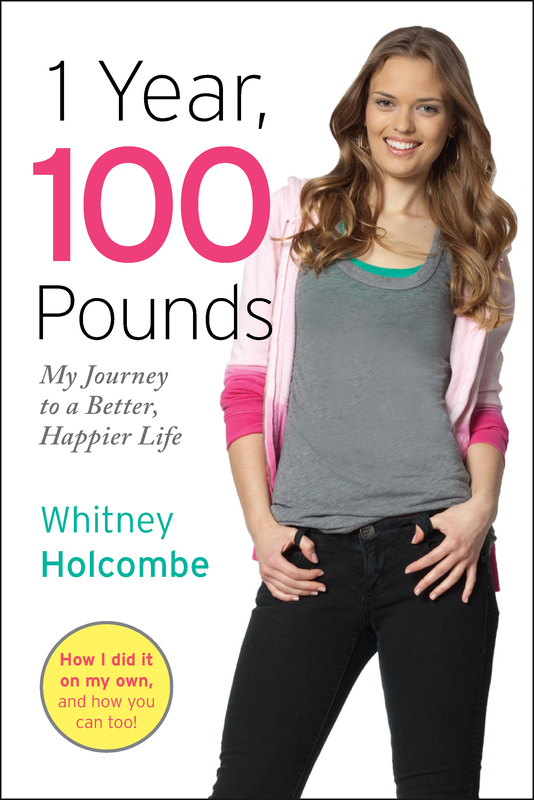 Photography © 2009 by Chris Eckert, Studio D, Hearst Communications Inc.
At age fourteen, Whitney Holcombe weighed 230 pounds. In one year, Whitney lost 100 pounds and found her healthy balance without the use of surgery, trainers, pills, or commercial weight-loss programs. Whitney now uses her success story to encourage teens to become healthy, beautiful confident young women with the world at their feet. She lives in New York. "Holcombe is a cheerleader for adopting a healthy lifestyle–there are no quick fixes here....Recommended for teens looking for a get-your-life-in-gear pep talk followed by good solid advice." "Written in a natural, friendly voice, the text clearly intends to counteract the harmful ideas about body image that often target teenagers and to offer a healthy lifestyle alternative to weight loss surgeries and medications. During a time when teenagers receive multiple messages from society, this is a good book to have on hand."